Palyul Changchub Dargyeling, D.C. Area (PCDDC), is a non-profit organization of Buddhist practitioners in the Palyul lineage of the Tibetan Nyingma tradition. Our mission is to offer authentic teachings and to create a gathering place for regular practice, instruction and study. We offer this place both for the community and for ourselves to develop a greater understanding through study and realization through practice. We strive to emulate the values personified by our teachers, including compassion for all beings, equanimity, patience, openness, ethical behavior, non-grasping, generosity, humility and simplicity. • Basic Meditation – Every Sunday, 10 to 11 AM, group instruction and practice, open to all. • Guru Yoga – The first Sunday of every month at 11:30 AM. This short practice consists of visualizing Guru Rinpoche, requesting and receiving his blessings, and merging one’s mind with the lama’s wisdom mind. 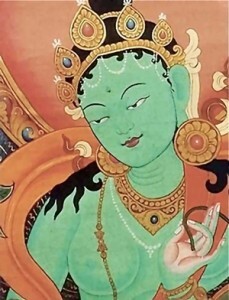 • Short Green Tara practice – The third Sunday of the month, 11:30 AM to noon. • Medicine Buddha – If the month has a 5th Sunday we do a medicine Buddha sadhanna at 11:30 AM. Every 2-3 months we will have a visiting lama who will give lectures and empowerments (spiritual blessings). These are weekend long affairs usually Friday through Sunday. They are usually open to all though some teachings are restricted to advanced students (on an honor system). Green Tara is the essence of the holy minds (dharmakaya) of all the buddhas. She is the Mother from whom all the past, present and future buddhas have been born. Her name means “the Swift Liberator” indicating her powers to hastily release and free us from the causes of samsaric suffering, eight fears or dangers (ignorance, hatred, attachment, pride, jealousy, wrong view, doubt and miserliness) and physical as well as mental diseases. It is said that through devotion and practice to the powerful Tara, one may be freed from suffering, liberate sentient beings and ultimately, achieve enlightenment. Every Sunday from 10 a.m. to 11 a.m. we have a meditation class. Time is given to basic meditation instructions, to actual practice, and to questions and answers. The main practice of this group is known as shamatha (calm abiding) meditation, the foundational technique for all other Buddhist meditations and practices. The ability to calm the mind gives rise to many benefits, including: greater concentration; improved memory; decreased stress and anxiety; increased confidence and self-awareness. Any and all who wish to learn about meditation are welcome to join us. The first Sunday of every month at 11:30 AM. This short practice consists of visualizing Guru Rinpoche, requesting and receiving his blessings, and merging one’s mind with the lama’s wisdom mind. Guru Yoga is part of the Ngöndro or preliminary practices and accumulating Guru Rinpoche’s prayer and mantra are a necessary foundation for future blessings. We practice the One Hundred Deities sadhana with tsog offering the second Sunday of every month at 11:30 AM. practice lasts about an hour and a half. A “tsog” is a ritual banquet supplied by offerings of the participants. Bring offerings of flowers, finger foods, non-alcoholic beverages. Every Guru Rinpoche Day (the 10th lunar day of the Tibetan calendar) we celebrate with a Rigdzin Dupa practice. Practice lasts around 2 hours. “Rigdzin Dupa, ‘The Gathering of Awareness Holders’, is a very powerful practice for dispelling obstacles and is one of the three root sadhanas in the Longchen Nyingthig tradition.” -Khenchen Tsewang Gyatso Rinpoche. We celebrate Dakini Day (the 25th lunar day of the Tibetan calendar) with a Yumka practice and tsog. Practice lasts about 2 hours. A “tsog” is a ritual banquet provided by offerings of the participants. Offerings may be of flowers, finger foods or non-alcoholic beverages. The central meditation visualization of the Yumka practice is on the wisdom Dakini Yeshe Tsogyal, foremost consort to Guru Rinpoche. Yumka is renown as a full path to enlightenment and as an especially efficacious means for purifying one’s Vajrayana samaya. Depending on interest we also provide a reading group with discussion of “The Bodhisattva Way of Life” a.k.a. the Bodhisattvacaryavatara, by Santideva. Santideva, an eighth-century Buddhist monk, is among the most renowned and esteemed figures in the entire history of Mahayana Buddhism. Open to all.